Address of the location: Burgas, Complex "Slaveikov"
The beginning of the noise monitoring: November 2010г. 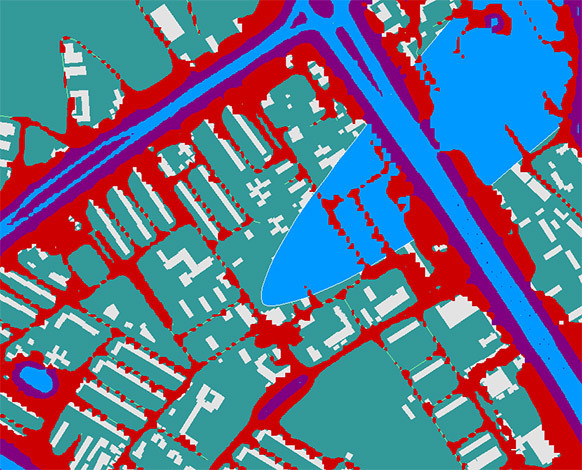 Noise categorization: Location with predominantly impact of noise from road traffic, as well as accidental overflying airplanes, departing from the main routes (Warning: changed situation in the summer of 2013. - with regard to the new defined ATC routes for landing / takeoff / test flights). Defined period "day period" (according to Regulation No 6 of 26 June 2006 on "indicators of environmental noise"): 07-19 h.
Defined period "evening period: (according to the Regulation No 6 of 26 June 2006 for" performance of noise in the environment "): 19 – 23 h.
LAmax = 81.6 dB LAmaxmaximum A-weighted sound level in decibels [dB (A)]. This is the maximum value of the current A-weighted noise level for a given time interval. LAmin = 36.1 dB LAminminimum A-weighted sound level in decibels [dB (A)]. This is the minimum value of the current A-weighted noise level for a given time interval. LAF10 = N/A dB LAF10The level of noise along a curve and which has exceeded 10% of the measurement time (T). The parameter is used as a measure of the noise from the main measured (released) source. LAF90 = N/A dB LAF90The noise level in a curve which is exceeded for 90% of the time of measurement (T). The parameter is used as an indicator of the ambient (background) noise.